Paris attacks: Who were the victims? France has declared a national state of emergency and tightened borders after at least 128 people were killed in a night of gun and bomb attacks in Paris. Eighty people were reported killed after gunmen burst into the Bataclan concert hall and took hostages before security forces stormed the hall. People were shot dead at restaurants and bars at five other sites in Paris. At least 180 people were injured. These are the deadliest attacks in Europe since the 2004 Madrid bombings. French President Francois Hollande, visibly shaken, called Friday night's almost simultaneous attacks "a horror" and vowed to wage a "merciless" fight against terrorism. Paris saw three days of attacks in early January, when Islamist gunmen murdered 18 people after attacking satirical magazine Charlie Hebdo, a Jewish supermarket and a policewoman on patrol. The attack on the 1,500-seat Bataclan hall was by far the deadliest of Friday night's attacks. 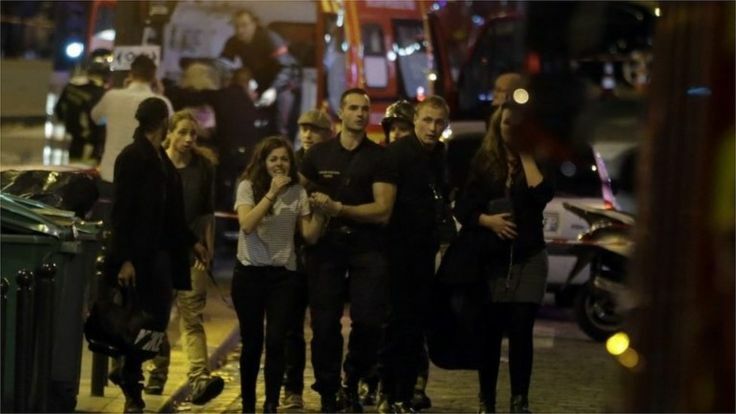 Gunmen opened fire on concert-goers watching US rock group Eagles of Death Metal. The event had been sold out. "At first we thought it was part of the show but we quickly understood," Pierre Janaszak, a radio presenter, told Agence France Presse. "Nothing gives one person so much advantage over another as to remain always cool and unruffled under all circumstances." He said the gunmen took 20 hostages, and he heard one of them tell their captives: "It's the fault of Hollande, it's the fault of your president, he should not have intervened in Syria". Meanwhile, not far from the Place de la Republique and the Place de la Bastille, three busy restaurants and a bar were targeted by gunmen armed with Kalashnikovs. 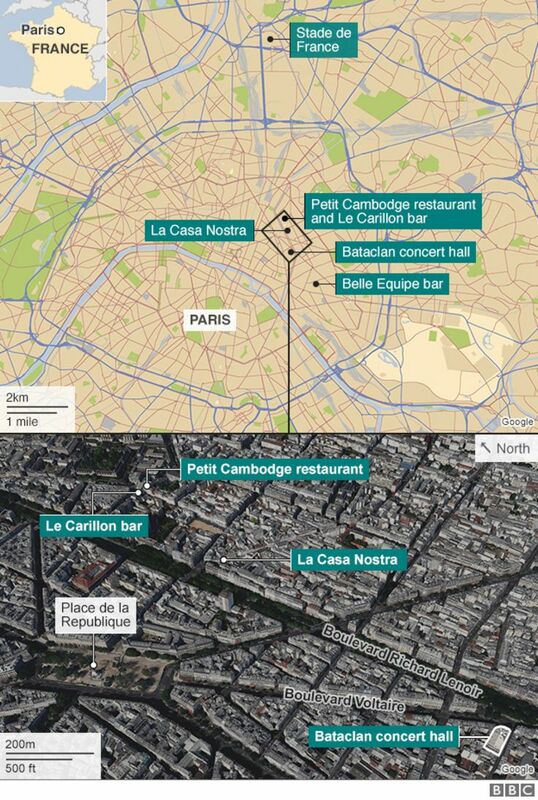 Around 40 people were killed as customers were singled out at venues including a pizza restaurant and a Cambodian restaurant, Le Petit Cambodge. "We heard the sound of guns, 30-second bursts. It was endless. We thought it was fireworks," Pierre Montfort, a resident living close to Le Petit Cambodge said. The other target was the Stade de France, on the northern fringe of Paris, where President Hollande and 80,000 other spectators were watching a friendly international between France and Germany, with a TV audience of millions more. The president was whisked to safety after the first of at least two explosions just outside the venue to convene an emergency cabinet meeting. Three attackers were reportedly killed there. As the extent of the bloodshed became clear, Mr Hollande went on national TV to announce a state of emergency for the first time in France since 2005. The decree enables the authorities to close public places and impose curfews and restrictions on the movement of traffic and people. Paris residents have been asked to stay indoors and about 1,500 military personnel are being deployed across the city. All schools, museums, libraries, gyms, swimming pools and markets will be shut on Saturday as well as Disneyland Paris. 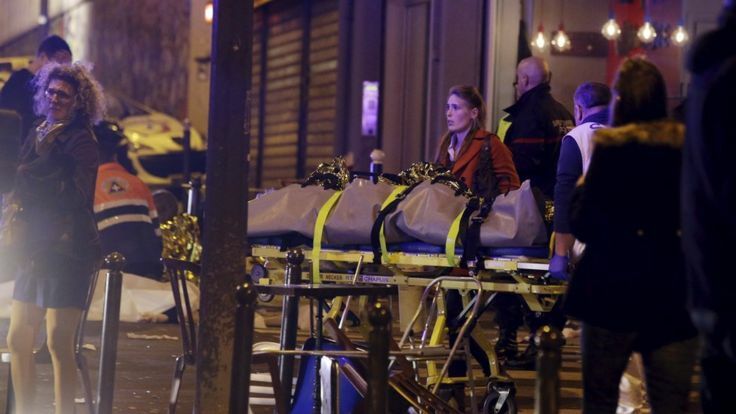 All sporting fixtures in the affected area of Paris have also been cancelled, AFP reports. US President Barack Obama spoke of "an outrageous attempt to terrorise innocent civilians". Witnesses have been speaking of "carnage"
It's just 10 months since Paris was the scene of multiple terrorist attacks, first the massacre of staff at the satirical magazine Charlie Hebdo and then a hostage-taking at a Jewish supermarket. What happened in Paris on Friday night is exactly what Europe's security services have long feared, and tried to foil. Simultaneous, rolling attacks, with automatic weapons and suicide bombers in the heart of a major European city, targeting multiple, crowded public locations. The tactics have been used before, in Mumbai and elsewhere. But how they've come to Europe is one of many questions that will have to be answered. Were the attackers French citizens? If so, how they were radicalised, armed and organised - was it in France, in Syria, and by whom? Why weren't they detected? Is France, after two major attacks this year, uniquely vulnerable or does the carnage in Paris mean all of Europe faces new threats to our public places and events? And if a Syrian link is proven, will France recoil from that conflict or will it redouble its commitment to the fight against radical groups there? Are you in the area? Have you been affected by what has been happening? Do you have any information you can share? If it is safe to do so, you can get in touch by emailing haveyoursay@bbc.co.uk. Police have issued a photograph of a French national wanted in connection with Friday's deadly attacks in Paris that left 129 people dead. The man, named as Salah Abdeslam, 26, is described as dangerous. Reports say he had already been identified as the renter of a car used in the attack when he and two others were stopped by police near the Belgian border. The officers apparently let him go after checking his ID. Seven attackers, two of whom had lived in Belgium, died during a series of assaults in the city, officials said. Late on Sunday, French aircraft struck Raqqa in Syria - the stronghold of Islamic State (IS), the militant group that has claimed it was behind the Paris attacks. President Francois Hollande had described Friday's attacks in Paris as an act of war - and promised that France's reaction would be pitiless. Ten fighter jets operating out of French bases in Jordan and the UAE dropped 20 guided bombs on a command centre, recruitment centre for jihadists, a munitions depot and a training camp for fighters, the ministry said. The attack was carried out in co-ordination with US forces. French Interior Minister Bernard Cazeneuve said Friday night's attacks in Paris had been prepared "by a group of individuals based in Belgium" who had "benefited from accomplices in France". 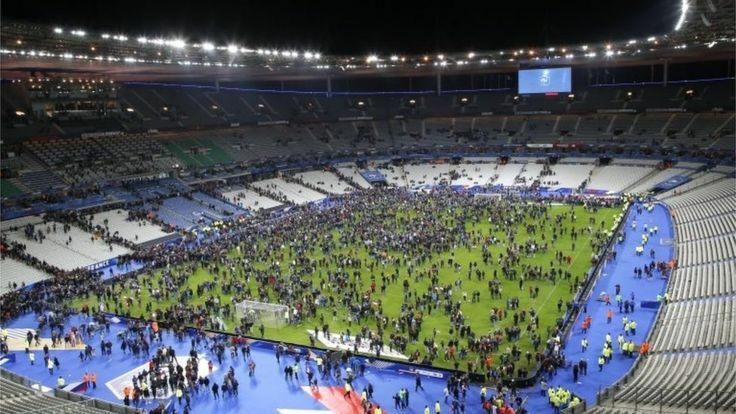 The attackers targeted bars and restaurants, a concert hall and the Stade de France, the country's main sports stadium. France is marking three days of national mourning. 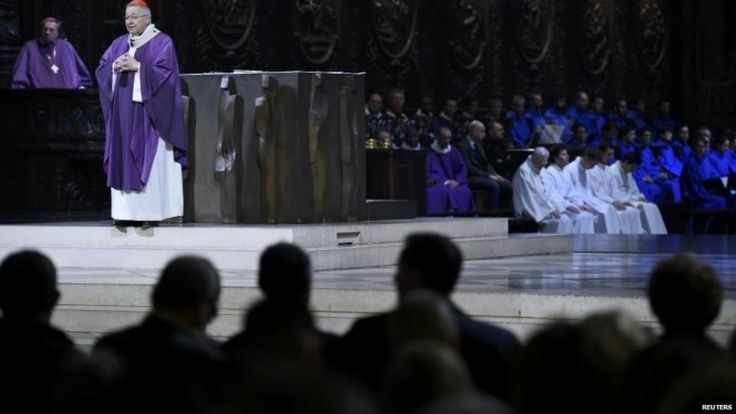 On Sunday, a memorial service was held at Notre Dame cathedral. Meanwhile panic broke out at the Place de la Republique, where hundreds of people had gathered to honour the victims. Crowds ran over flowers and candles. Police - who cleared the square - later said people may have mistaken the sound of firecrackers for gunfire. French police appealed for information about Salah Abdelslam but warned people not to approach him. Unnamed officials said he was one of three brothers linked to Friday's attack. Reports say Abdeslam had already been identified as the renter of a VW Polo found at the Bataclan concert hall, where 89 people were killed, when police near the Belgian border stopped him and two others as they travelled in another vehicle on Saturday morning. But the officers let him go after checking his ID, media reported, quoting French police and security sources. A Seat car found in Montreuil is believed to have been used by gunmen who opened fire on people in bars and restaurants on Friday, police say. A number of AK47 rifles were found in the car, French media quote judicial sources as saying. Both the Seat and the VW Polo were rented in Belgium. One of the Paris attackers lived in Brussels and another in the nearby suburb of Molenbeek, Belgian prosecutors said on Sunday, without naming either. A total of seven men had been arrested in Molenbeek, they added. Not all are being held in direct connection with the Paris attacks. A brother of Salah Abdelslam was said to be among them, while another brother is reported to be one of the seven dead attackers. The only dead attacker to be named so far is a 29-year-old Frenchman, Ismail Omar Mostefai. He had a criminal record and had been flagged up as a possible Islamist extremist by French intelligence. Media captionWho was Paris attacker Ismail Mostefai? French investigators are pursuing an international trail that stretches across Europe - and one concern for security services in other countries is how far Islamic State has already put in place the ability to replicate the Paris attacks. There are unconfirmed reports that a similar style attack might have been planned in Turkey for the same time but was foiled. Tracing back the Paris operatives to whoever organised them will be crucial in order to understand what else might be planned. These attackers do not appear to have been people simply inspired by IS, but rather trained operatives. And the fact that Western intelligence services do not appear to have picked up any signs of this plot from their human and electronic sources will only increase concerns.